One of the deep joys of wildlife gardening is when an idea comes together and a wildflower you've planted really takes off... and brings even more nature into your garden. That is exactly what happened this year with an experimental planting of a local native wildflower, Viper's-bugloss or Echium vulgare. 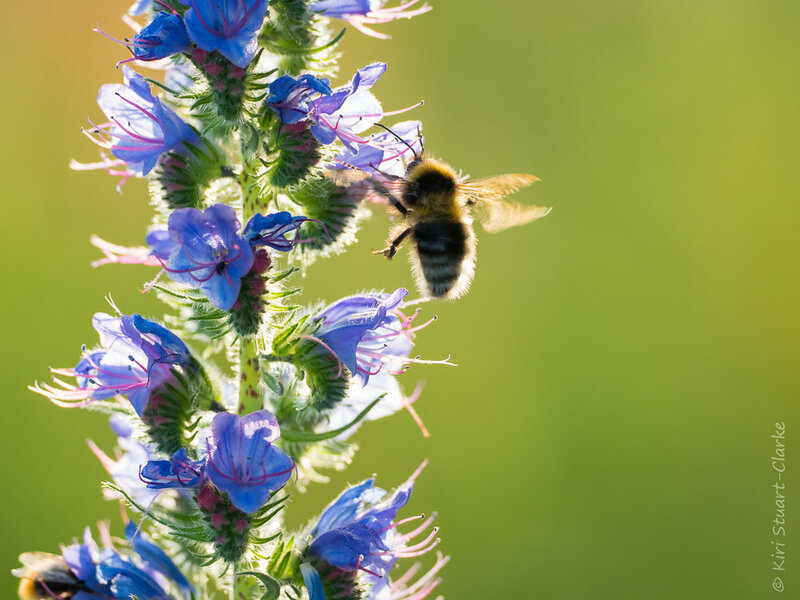 A member of the Borage plant family Boraginaceae, Viper's-bugloss is renowned for having a high wildlife value due to its flower's rapid nectar refill rate. This makes it a magnet for numerous species of bees, hoverflies, butterflies and other insects, which will revisit it at regular intervals throughout the day. It is also a caterpillar host plant for the glamorous Painted Lady butterfly and Golden Twin-spot moth. A tough, bristly and flamboyant biennial, Viper's-bugloss is commonly found in dry chalky grassland and heaths and along coastal cliffs and sand dunes. I first saw this striking plant growing in the wild locally in 2015. It was at Kelling Heath, a lowland heath reserve not far from the North Norfolk coast, and I'd been on a foray to see the diminutive Silver-studded blue butterflies resident on the nature reserve. I was returning to the car park after a successful mission when I spotted it and recognised the tall flower spike heavy with lilac blue flowers at first glance, even though I'd never seen one before. The bell-shaped open-rimmed flowers had vivid pink trailing stamens, and was besieged by a host of argumentative bees, butterflies and other insects all competing for the rich nectar source. Like most native wildflowers, Viper's-bugloss is embedded in traditional herblore, with around a dozen common names in existence, many of which, like Adderwort, Snake flower or Viper's herb, contain serpentine references. The precise origins of its common name are unclear, possibly relating to the snake's-head form of the seed pods mentioned by 17th Century herbalist Nicholas Culpeper, “After the flowers are fallen, the seeds growing to be ripe, are blackish, cornered and pointed somewhat like the head of a viper.” Other theories include a comparison of the mottled leaves to snakeskin, or perhaps an allusion to the bite-like irritation caused by contact with the plants sharp bristles or its poisonous characteristics when ingested. Perhaps because of these serpentine associations, Viper's-bugloss was traditionally used in herblore as an anti-venom for snake bites.The first documented herballist recommendation dates as far back as the first century AD and was made by a Greek Physician called Pedanius Dioscorides in a work called De Materia Medica. Even the species name Echium is derived from "Echis", the Greek for "Viper". However the term "Bugloss" used in many of our English common names is actually a reference to the ox-tongue shape and texture of its leaves and originates from the Greek word "bou" (a cow or ox) and the Latin "glosso" (tongue). Meanwhile I had long been pondering a horticultural problem in my wildlife garden at home. I was keen to add more wildlife friendly flowers closer to the house and enrich diversity as the garden was starting to mature, but was stumped with a problem area where next to nothing would grow. Despite our landscaper's best endeavours, not all of the poorest soil had ended up in the right place, our designated wildlfower meadow area. Some of it had ended up adjoining the bungalow and patio edge right at the top of the rear garden. Here the south facing slope was arid , in full sun all day long and only the relentless couch grass was flourishing. So I turned to natives I'd seen locally thriving in sandy arid conditions for a solution and bought a small Echium Vulgare plug from Glandford Wildflower Centre just outside Holt. I planted it alongside Common Century, Teasel, Red Valerian and Common Rock Rose, next to a humongous self-sown Common Mallow, which had given me the inspiration, in order to create a bee-friendly wildflower border of sorts. Very little happened last year and my husband was sceptical. But Viper's-bugloss is known for growing deep roots and this year - success! The Echium developed numerous flower spikes and is even out competing both the Common century and Red valerian. This weekend the month has earned its title of "Flaming June". In the sweltering 33 degree heat, I couldn't face venturing outside my garden gates. Towards the end of a long, sweltering afternoon, as the worst of the heat started to cool, I stood on our patio and enjoyed the constant humming of dozens of bumble bees as they methodically worked their way up each spike in turn, checking which flowers had refilled with nectar.